St Etheldreda’s Church is just a stone’s throw from the noise and bustle of modern day London and it is hemmed in by the glittering wealth of Hatton Garden, where gold, silver and diamonds are traded and millions of pounds change hands daily. But amid the clamour of mammon, there stands this hidden ancient gem, a spiritual sanctuary of the Middle Ages, a haven of peace and tranquillity. St Etheldreda’s Church was the town chapel of the Bishops of Ely from about 1250 to 1570. It is the oldest Catholic church in England and one of only two remaining buildings in London from the reign of Edward I. It was once one of the most influential places in London with a palace of vast grounds. It was like an independent state, the Bishop of Ely’s place in London or Ely Place as it is now called, and its chapel took its name from one of England’s most popular saints of the day, Etheldreda. 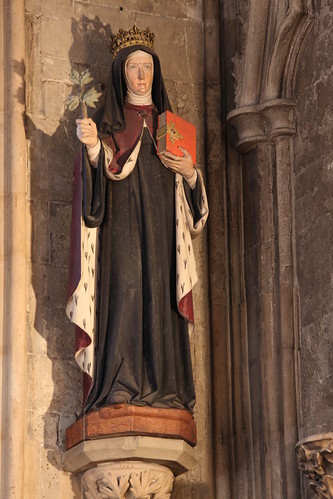 For more information on St Etheldreda, see the Ely Cathedral website. You can also read the Venerable Bede on St Etheldreda, or a more recent homily by Fr Tom Deidun. Back to London, to the church that bears her name, which was built in 1290 by John De Kirkeby, Bishop of Ely and Treasurer of England under Edward I. Why did the Bishops of Ely come to London and particularly Holborn? Well, first of all, a member of the diocese had bought a piece of property here with the idea of building a little oratory, but then, in the middle of the 13th century, when parliament was called, it was necessary for the Bishops to come to London, so they needed a residence and so the Bishop of Ely built himself a great palace. John De Kirkeby died leaving his property together with its liberties to the successors of the See of Ely. The whole estate was administered by the See of Ely and was outside the jurisdiction of the City of London. From 1316 were added a palace, orchards, vineyards, gardens and ploughlands until it spread over an area of 58 acres. As you come into the Upper Church under the choir screen, if you look to your right, the second coat of arms you see at the bottom of the window is of Simon Langham, Abbot of Westminster, Bishop of Ely, Archbishop of Canterbury, a sort of medieval high flier, as indeed were so many of the Bishops of Ely. Thomas Arundel still kept his suite at Ely House after his promotion to Archbishop of Canterbury, Primate of England. He let it to John O’Gaunt, Duke of Lancaster, son of King Edward III and father of Henry IV, after his palace at the Savoy was burnt and looted by Watt Tyler. Tyler, who was leading a peasants’ revolt against a poll tax, met his death nearby in Smithfield at the hands of the Lord Mayor of London. John O’Gaunt was to spend his remaining days at Ely House. And it was at St Etheldreda’s that the Black Prince, brother of John O’Gaunt, kept the Feast of Trinity in 1357 and ordered 16 swans from the Thames to be sent to Ely House. John Moreton, Bishop of Ely from 1479 to 1485, was Lord Chancellor in the reign of Henry VII. This was the period after the Wars of the Roses and it was important that the Barons be kept in check. So Moreton devised a tax which worked like this. If the King visited a Baron and he put on a good show, then the presumption was that he had plenty of money – therefore fleece him! But if he put on a poor show, the presumption was that he had money but he’d hidden it away – therefore fleece him! This in fact was part of a ruse to get the Bishop out of the way and in fact the following day the Bishop found himself in prison. St Etheldreda was still held in great esteem throughout England. Pilgrimages were made to her shrine and badges were worn by those who had completed the pilgrimages. She was a patron of chastity and was invoked for help against infections of the throat and neck. To this day, the Blessing of Throats is an important annual event at St Etheldreda’s. Many Bishops of Ely were men of exemplary charity, feeding up to 400 poor people a day. To explore the fascinating links between St Etheldreda’s Church and the Bard, read parishioner Peter Bridgeman’s essay Shakespeare and St Etheldreda’s, republished on this website with his kind permission. It’s impossible to tell the story of Ely without talking about one of the most controversial kings, Henry VIII. In 1531, he and his wife Catherine of Aragon were guests at Ely Palace. They were attending a lavish feast given by the then Bishop of Ely, Nicholas West, which is said to have lasted for five days. But the sumptuous feast was filled with foreboding. Henry VIII and Queen Catherine dined in separate rooms, one of the first public indications that Henry was thinking of taking a new wife. Henry wanted a son and it seemed Catherine couldn’t give him one and so he was looking for an annulment to the marriage. But the Pope was reluctant to give this, because of Catherine’s nephew Philip of Spain. After a long and drawn out legal process, Henry was denied his annulment. But he had already burnt his bridges by marrying Anne Boleyn with the connivance of Thomas Cranmer. Henry did this by breaking off relations with Rome, making himself head of the church in England and appointing Cranmer, a man willing and eager to do his bidding, as Archbishop of Canterbury, with Cranmer in turn giving Henry his divorce. Bishop, now St John, Fisher acted as Queen Catherine’s counsel, together with Bishop West of Ely, and argued against the divorce. These men, who had thwarted Henry, were both marked out for death. But Bishop West died before Henry’s vengeance could fall upon him. Henry lived with an uneasy conscience. He knew that men like Sir Thomas More secretly disapproved of what he had done. Henry craved approval and he passed new laws to force his subjects to agree with him. His Act of Supremacy declared the King to be the only Supreme Head on Earth of the Church of England. An oath was then devised for all his subjects. Refusal to take it was treason. John Houghton was the Carthusian Prior of the London Charterhouse, whose monastery bordering the Ely lands is little changed to this day. He learnt that his Carthusian monks had been selected to take the oath. Henry was selecting the most devout religious in the land – if they could be forced to take the oath, the others would soon follow. John Houghton was joined by two other Carthusian priests, Robert Lawrence of Beau Vale and Augustine Webster of Axholme. The three Carthusians, realizing that they might soon have to choose between denying their beliefs and death, celebrated the mass of the Holy Spirit. Then they went to Westminster Hall to see the King’s Chief Secretary, Thomas Cromwell, to seek exemption from the oath. Cromwell cut short Prior Houghton’s pleas and had all three priors arrested. From Westminster Hall they were taken to the Tower and there the royal commissioners went to visit them, to enquire of them why they wouldn’t accede to the King’s request. and that was the view of all three and so all three were to die for treason. On the fourth day of May 1535, the monks were led out from their cells in the Tower of London for execution by means of the Tyburn Tree. As they were passing the Bell Tower, they were seen by Thomas More, who was imprisoned there with his daughter Margaret, as he was to be for fifteen months prior to his execution. From his narrow window, Sir Thomas More looked down on the monks. as cheerfully as bridegrooms to their marriage. The monks were bound to wicker hurdles and dragged from the Tower of London to Tyburn Gallows for execution, still wearing their religious habits, something previously unheard of in England. The monks had been sentenced to a traitor’s death. They were made to stand in a cart, which, when driven away, left them hanging until half dead, and then cut down whilst still alive – their hearts and intestines were torn out and burned in front of them; then their bodies were beheaded and quartered. I beseech all here present to attest for me on the dreadful day of judgement that being about to die I declare that I have refused to comply with the will of His Majesty the King, not from obstinacy, malice or a rebellious spirit, but solely for fear of offending the Supreme Majesty of God. Priors Webster and Lawrence followed him to their deaths along with two other priests. All five now stand together in St Etheldreda’s great West window, which depicts their execution. 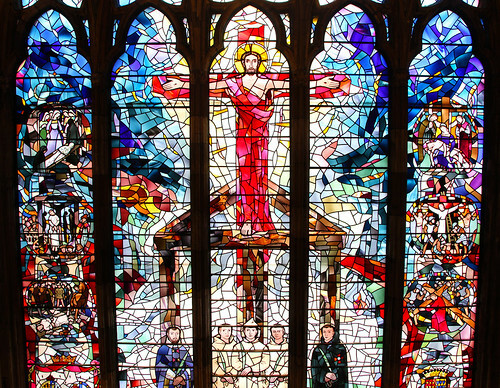 This window is reputedly the largest in London, and is dedicated to the English Martyrs. The dismembered parts of the monks’ bodies were displayed at various sites across the city. The arm of John Houghton was hacked off and brought to his Charterhouse and nailed to its front door to impress upon the other monks the seriousness of Henry’s intentions. The first Bishop of the newly authorized religion was Thomas Goodrich, a zealous reformer, who destroyed the Great Shrine of St Etheldreda in Ely Cathedral. He built a tavern called the Mitre adjoining St Etheldreda’s for the benefit of his retainers. Henry VIII died in 1547. His nine year old son became King Edward VI. The men who controlled the boy King, like most powerful English families, had benefited greatly from Henry VIII’s dissolution of the monasteries. They feared that if there was reunion in Rome they might have to give back their newly acquired wealth. Henry maintained to the end of his life that he was still a Catholic, though a Catholic who disagreed with the Pope. But the new men behind the throne set about destroying Catholic belief and practices. The mass, which had been celebrated in England since the coming of Christianity and said and sung by all 21 Bishops of Ely in the Church of St Etheldreda’s since it was first built, was ordered to be abolished. It was replaced by the Book of Common Prayer. Then the great destruction began of shrines; and even the magnificent medieval stained glass windows. At the age of sixteen, Edward lay dying of consumption. The Duke of Northumberland, aided by Cranmer, obtained his signature to a document transmitting the Crown to Lady Jane Grey and not the rightful heir, Henry’s eldest daughter Mary, the only surviving child of Queen Catherine. But the country rallied to Mary who became Queen. Mary tried to take England back into the Catholic fold. The mass at St Etheldreda’s was restored. She considered reformers such as Cranmer to be heretics, who had plotted against the one true church. Cranmer, guilty of treason for his part in the Lady Jane Grey plot, should have been hanged, drawn and quartered. But, as the punishment for unrepentant heresy had always been burning, Mary burned him at Oxford. Many more died in the fires of Smithfield. For this, Mary was to gain the name of Bloody Mary. After a five year reign, she died childless. She had sent out the royal commissioners to test out her half sister’s beliefs and Elizabeth swore that she was a Catholic, so Mary accepted her word and declared Elizabeth heir to the throne. She was crowned Elizabeth I and made herself Governor of the Church in England, but for Elizabeth to uphold Catholic teaching was to admit that she was illegitimate, so, despite her promises, she and her Chief Minister William Cecil began the systematic destruction of the church and its teachings. The mass was again abolished. Past the Church of St Etheldreda’s were brought the crucifixes to be burnt at Smithfield. To hear mass became a hanging offence and all priests who upheld Catholic belief were hunted men. Proud Prelate, I understand that you are backward in complying but I would have you understand that I who made you what you are can unmake you. And if you do not faithfully fulfil your engagement, by God, I will immediately unfrock you. It’s not surprising the Bishop complied. In 1576, the Bishop granted a lease to Sir Christopher for just £10, a few loads of hay and one red rose a year. Sir Christopher built Hatton House, a magnificent building, and took over most of the Ely lands and gardens. built by Bishop Goodrich in 1546.
part leased to Sir Christopher Hatton. During Sir Christopher’s tenancy, part of the undercroft (Crypt) was used as a tavern, so that choruses and drunken brawls would often interrupt the services in the upstairs chapel. The Queen’s favourite often entertained his mistress in his new home and borrowed great sums of money. As Sir Christopher lay dying at Ely, Elizabeth came to feed him with her own hand, but she pestered him for the money he owed her, what today would be the equivalent of six and a half million pounds. The persecution of Catholics in Elizabethan England intensified. Statues along each side of the Upper Church testify to the men and women of the district who stayed loyal to their ancient faith and who became martyrs. Swithin Wells was an Elizabethan gentleman living in a house near St Etheldreda’s. He put his house at the disposal of priests and mass was regularly said there. On November 8th 1591, Father Edmund Gennings, a 24 year old priest, was saying mass when the house was raided by the arch priest hunter, Richard Topcliffe, and his men. Ten people hearing the mass were arrested and later sentenced to be hanged. Father Gennings was found guilty of treason and was sentenced to be hanged, drawn and quartered. Swithin Wells was arrested on his return to the house and at his trial was found guilty of harbouring a priest and was hanged outside his own front door. Margaret Ward learnt of a tormented priest in the notorious Bridewell Prison. Having befriended the jailer’s wife, she managed to smuggle a rope into the cell. The priest let himself down to the river below in the middle of the night to where a waterman John Roche had a boat waiting for him. The priest escaped but Margaret and the boatman were arrested. Margaret was strung up so that only the tips of her toes touched the ground when she was flogged. Then she and John Roche were hanged at Tyburn. In 1620, the Spanish Ambassador, the Count of Gondomar, a face so loved by the artist El Greco, moved into Ely Place. The Bishop’s Palace was his residence and mass was again allowed to be said in St Etheldreda’s, because an ambassadorial residence and grounds are considered part of the country they represent. To hear mass was still punishable by death for English Catholics but despite the dangers they flocked to St Etheldreda’s. It was written at the time that more persons were drawn to mass at Gondomar’s little private chapel in Holborn than anywhere else. James I was eager for his son Charles to marry the Infanta of Spain. As a gesture of goodwill between the two countries, James freed all Catholics in prisons throughout the land, some four thousand of them. He had them delivered to Gondomar’s residence and the Count in turn provided them with free passage to countries where they could worship in peace. But when negotiations for the Spanish match broke down, Gondomar was recalled. His successor was refused permission to take over his residence and no more masses were allowed to be said in St Etheldreda’s. authorized by Acts of Parliament. The next Bishop of Ely was Matthew Wren, uncle of Sir Christopher Wren, the builder of the present St Paul’s Cathedral. Bishop Wren tried to get back from the Hatton family all the land and properties loaned them in the Elizabethan times. Bishop Wren for his pains was reported to the Puritan Parliament for his Popish practices and imprisoned in the Tower of London. See the foundations now laying for a long street and buildings in Hatton Garden designed for a little town, lately an ample garden. By the time Bishop Wren was released from prison, the spacious garden was filled with streets and houses and the herb gardens, vineyards, saffron fields and meadows were all covered by a cheap housing estate. September 2nd saw the fire as one entire arch of fire about a mile long. It made me weep to see it. The churches, houses and all on fire and flaming at once and a horrid noise the flames made and the crackling of houses. The Great Fire of London swept through the City and destroyed everything in its path until it reached St Etheldreda’s. Then the wind changed and the ancient church was saved. By the time the fire had burned itself out, two thirds of London were destroyed. Over the next 100 years, however, the Bishops of Ely allowed Ely Place to deteriorate. The gardens were unkempt with rabbits running wild and the medieval palace was a palace no longer. Plans for utilising the site, including a debtors’ prison and a distillery, all foundered. He kept the Chapel to serve as a place of Anglican worship for the residents of the neat terraces of Georgian houses he had built. The Chapel he modernised, to bring it into line with Georgian taste. The corner turrets at the East end were removed and two Gothic entrance doors were made under the great East window. These were approached from the street by a central stone stairway with iron rails. He also put up wooden screens to form passages inside the Church and he concealed the magnificent original timber roof by hanging from it a heavy plaster ceiling. It was said the fact that the roof didn’t collapse was a tribute to the ancient joiners’ craft and to Divine Providence as well. A large central pulpit and box pews were introduced, but the modernised Chapel attracted few worshippers and in 1820 it passed into the hands of the National Society for the Education of the Poor, who were trying to win over the Irish who were settling in the area. 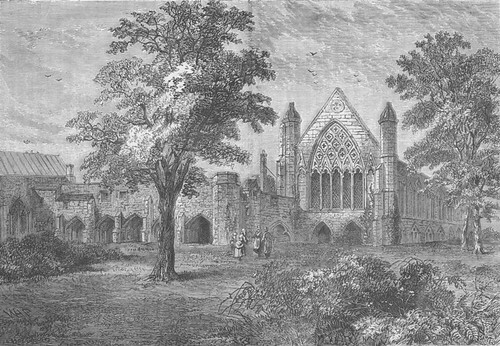 A gallery was built on each side of the church for the poor, to separate them from the well-to-do residents of Ely Place. It was hoped that these would continue to pay rents for their pews on the floor of the church, but the attempt to combine charity and profit was a failure and the church was closed. In 1829, the Catholic Emancipation Act was passed and for the first time for 300 years it was no longer illegal for Catholics to have churches and say mass. In June of 1835, three Italian priests arrived at Tilbury. They were members of the Institute of Charity, founded by Antonio Rosmini, and later to become known as Rosminians. They introduced into England a new form of clerical dress, the Roman collar or dog collar. Queen Victoria’s London was in marked contrast to the city Edward I presided over six centuries earlier. The population had risen from 40,000 to over three million. Parks were the only open spaces in a densely overcrowded city. For Charles Dickens, the slum areas surrounding St Etheldreda’s and Ely Place became the very heart of the quarter he made his own. Ely’s former fields of saffron had by Dickens’ day turned into the city’s most atrocious slums. It was to Saffron Hill that Dickens had the Artful Dodger take Oliver Twist and it was nearby that he sited the infamous Fagan’s Den and Thieves’ Kitchen. It was to Ely Place that David Copperfield went to visit Agnes, the woman he loved, at the house of Mr Waterbrook. A “gloomy street” was how Dickens described Little Britain as the location for Mr Jagger’s office in Great Expectations. Bleeding Heart Yard is also featured in Little Dorrit. The Yard takes its name from one of Sir Christopher Hatton’s descendants. Lady Elisabeth Hatton, so legend has it, was found brutally murdered with her heart torn from her still pumping blood. restoration of a bulding so historically interesting and so architecturally valuable. The opportunity for the restoration for which so many had pleaded did not arise for a further 20 years. Then the whole of Ely Place had to be sold to settle a lawsuit between the descendants of Charles Cole. The Rosminians had worked very successfully in the Nottingham and Leicester areas and later in North London. 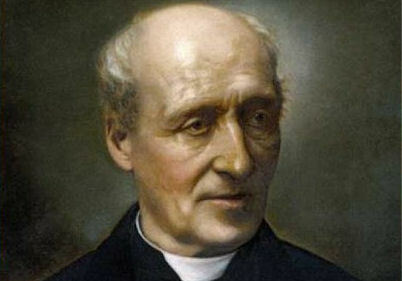 The Rector of the North London Mission was Father William Lockhart, an Oxford convert and friend of the man who was to become the great English Cardinal, John Henry Newman; and it was Lockhart’s conversion that finally convinced Newman that he too should become a Catholic. The then Cardinal, Henry Manning, wished the Rosminians to serve in the slum areas of Holborn. Father Lockhart was chosen for this task. And in December 1873, he learned that the ancient Chapel of St Etheldreda’s was about to be sold by auction. considerably higher sum than was bid, but Father Lockhart declined. Father Lockhart launched an immediate restoration appeal. Money poured in. Father Lockhart then began years of extensive and costly restoration. It was Father Lockhart who decided to repair the Crypt. First of all, he had to attend to the floor which was made of hard earth trampled in over the centuries. And they had to remove about two and a half feet of earth. In the course of digging, they came across eighteen bodies and these were bodies from the Fatal Vespers of 1623 and we know that one of the bodies concerned was a priest, because he was buried facing the West. The Upper Church was then restored with all the splendour intended by its medieval builders. The balconies and other 18th century additions were removed. The plaster ceiling was brought down, amid what was described as “inconceivable filth”, to reveal the original medieval roof surviving virtually intact; and the 13th century design still enthrals modern architects. Layers of plaster were scraped away in the interior to reveal delicate sculptures and mouldings. John Francis Bentley, the architect of Westminster Cathedral, designed the magnificent choir screen with its wrought iron grilles and gate. The screen incorporates a confessional, an organ and a choir gallery. The royal coat of arms, which had been hanging over the main altar since the reign of Charles I, was removed and placed in the cloister. Since Elizabethan times, such royal emblems had been ordered to be hung in churches to repudiate the authority of Rome and the successor of St Peter. A special relic was also given to the Church. It was a piece of the uncorrupted hand of St Etheldreda. The hand, removed in Norman times, had been kept during the Persecution in a secret hiding place on the Duke of Norfolk’s estate. The relic now lies in the jewel cask to the right of the high altar. Five years after the auction, Father Lockhart completed the restoration of the Upper Church and on June 23rd 1878 Solemn High Mass was celebrated for the first time for over 200 years. St Etheldreda’s was soon a thriving community. Father Lockhart kept open house, and poets, writers and playwrights made their home there. For more on William Lockhart, click here. In 1925, the Royal Commission on Historical Monuments recommended St Etheldreda’s especially worthy of preservation and it was scheduled as an ancient monument. Even at that time, Ely Place was still like an independent state, under the jurisdiction of Ely, Cambridge, and not part of London. Eleven o’clock and all’s well….. twelve o’clock and all’s well. During the last half of the year night raids became frequent and much damage was done to property with considerable loss of life. The building opposite St Etheldreda’s suffered a direct hit. On Saturday night another long disastrous raid. St Etheldreda’s was hit by an explosive bomb which tore a hole in the original roof about six feet in diameter, stripped a good part of the tiling off the roof and sent three beams hurtling to the floor of the Church. The explosion also blew out what was left of the stained glass windows …a number of people were in the Crypt when the bomb fell but mercifully no one was injured. A new thriving London rose on the bomb sites surrounding St Etheldreda’s. Seven years were needed to repair the bomb damage to the ancient Chapel. The great East window made by Joseph Edward (Eddie) Nuttgens and completed in 1952 reflects all the original medieval splendour. Christ is enthroned as King, watched by his mother Mary and St Joseph. The Dove symbolises the Holy Spirit and at the apex God the Father completes the Trinity. St Etheldreda, the Church Patron, and St Brighid, Patron for the First Mission to the Poor Irish, stand at each side. The four Evangelists, Matthew, Mark, Luke and John look down on them all. There is also the scene of the Last Supper and high in the main traceries are the nine choirs of angels, breathtaking in their magnificence. The work is still going on. In the early 1990s, when parts of the ancient stonework were found to be crumbling, £300,000 had to be spent on yet more restoration. Archaeologists, digging in the area of the pantry, uncovered colourful Flemish tiles hidden for hundreds of years. They had stumbled across the original 13th century cloister. St Etheldreda’s is a busy parish, much used for baptisms, weddings and funerals. But it is not an empty relic. It is part of our national heritage and is used daily for the purpose for which it was built over 700 years ago.